The Porta Brace AH-3H-MEML Audio Harness & Belt (Large) is primarily used to carry audio mixers and can be used with the Porta Brace Audio Organizer or Audio Recorder cases. The Memory Foam padded shoulder straps "remember" your body shape for a contour fit that provides comfort, convenience, and viewing of your audio mixer; everything stays secure, even while on-the-run. The harness belt clips onto "D" rings so it is easy to get on and off; the clips fasten instantly to the rings. The optional MH-1, MH-2 or MH-3 Mic Holsters can be used with the waist belts. Memory Foam padded shoulder straps "remember" your body shape for a contour fit. Optional MH-1, MH-2 or MH-3 mic holsters can be used with the waist belts. Box Dimensions (LxWxH) 23.0 x 10.0 x 6.0"
AH-3H-MEML Audio Harness & Belt, (Large ) is rated 4.0 out of 5 by 4. Rated 4 out of 5 by Eric from Very comfortable This is a well designed product, with proper padding and support for even the biggest sound recordist. Standing all day while holding a 5 input mixer, four wireless receivers, a BDS power supply with battery and a wireless hop, this thing is a real back-saver. I do wish there was a way to fold it up neatly while it's attached to the mixer bag, but that's just a minor beef. However, Portabrace should include stronger caribiners - not these cheap knock-off variety that can be had 12 for a dollar. These are simply not strong enough to withstand the rigors of day in and out use in a pro environment. I'm off to the hardware store to find some replacements. 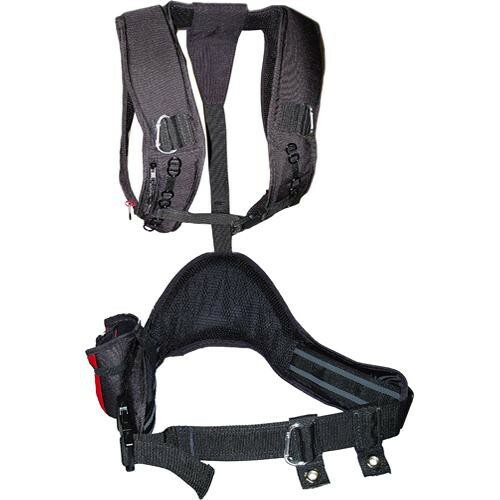 Rated 5 out of 5 by Anonymous from Ease for that pain your Back If you run audio you'll love this harness. It provide comfort and relief. i highly recommend this harness to every audio tech out there. Rated 2 out of 5 by James the Sound Man from Large, Hot, and Bulky I purchased this harness as I have used the lightweight portabrace harness for the past few years. I tried this harness on for about 2 hours with my sound bag, making every adjustment possible. Never could get it comfortable. Under the shoulder pads is a soft rubber which after 2 hours rubbed me raw through a tshirt. Its also very hot. Just not a good product for the run and gun ENG sound mixer.